I've been playing the demo for Rayman Legends recently and wow it's amazing. The worlds are gorgeous, the gameplay feels just a little bit tighter and the sense that the game is a half-baked mashup of earlier ideas has all but evaporated. I feel a bit sad there's no real Murfy implementation on PS3, but then I suspected that a dressed up version of the Luma from Mario Galaxy 2 might not be all that compelling over an extended period of time. So, I preordered Saints Row 4 and started playing it today. Taiju wrote: The biggest topic everybody was talking about was price. Is it gonna be Free to play? Pay to Play? 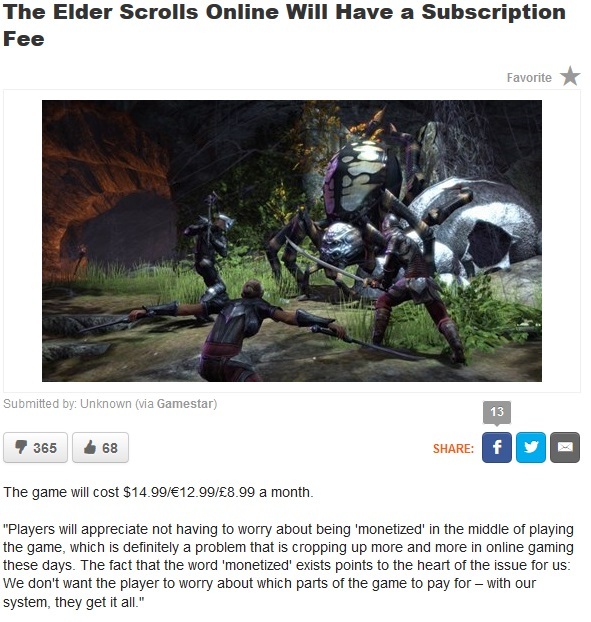 Or, will they go the route Guild Wars 2 did, and make it a one-time payment of about $60 or so? I personally wouldn't mind the one time payment thing. Online games like that can't win, really. If they're free you get nickel-and-dimed over most of the features just so the game can turn a profit, and if they have a subscription you inevitably feel ripped off and end up wondering what the hell you're spending so much money on. I'm consistently impressed by what one can do in LittleBigPlanet. I'm trying to make a murder mystery game, and as a part of it I've made a magnifying glass that reveals hidden items when you look at things through it. That Move pack came in handy. That said, I can't seem to get wormholes to work. Basically, wormholes let you move Sackboy from one part of the level to another without killing him. But as you can't make a two-way wormhole it makes my "press triangle to enter the room" idea problematic. Couldn't you just use two sets of wormholes? Oh, I do, but for some reason, when you layer them on top of each other it automatically teleports you from one set into the next set, even if they aren't wired together. It also seems to do this if you stack them. Got a couple more Genesis games....Aladdin and King of the Monsters 2 (apparently a port of a Neo-Geo game....I will see how well it fares in translation). The cookies you had will remain, and all your buildings (and grandmas and whatnot) are converted into cookies so you can buy them again in the new version. One reason why this version is better: it makes cookies as long as it's open in a tab, the screen doesn't have to be open like in the old version. It's more like the Candy Merchant game now, I liked that. It's also prettier now and you can sell buildings, which you couldn't before, and there's a bunch of boosts and updates that you can buy. EDIT: Join meeeee so I can know if I'm doing a good job or need to click this cookie harder to beat you. I need to be the Cookie Mistress. This is how obstinate I am: when I went to The Exchange to buy a Sega Genesis two weeks ago, I was hoping the Model 1 I'd been looking at was still there. When I got there, it had already been sold, so I bought the Model 2. Fine. ...so what did I get yesterday, and then hook up to my 47" flatscreen television? The Genesis Model 1. JT I'm staging an intervention. You clearly cannot handle all these videogames. Now help yourself to some complimentary Intervention Ice Cream. Pfffff. I got an Atari 2600 in it's box. Well I'll never talk! You'll never break me! Do your worst!